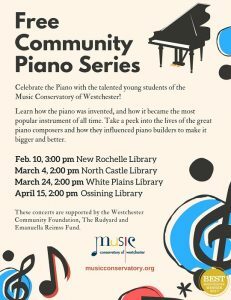 Celebrate the Piano with the talented young students of the Music Conservatory of Westchester! In this free, educational concert series, learn how the piano was invented, and how it became the most popular instrument of all time. Take a peek into the lives of the great piano composers and how they influenced piano builders to make it bigger and better. These concerts are supported by the Westchester Community Foundation, The Rudyard and Emanuella Reimss Fund. Free Community Piano Concert Series!